Rebecca Soni's time for this 50 m B Final event was 30.68 seconds. This unusual view of Rebecca Soni's stroke provides some insight into her ascendance to the top of women's breaststroke swimming. This writer has not viewed any adequate perspectives of recent men's breaststroke, other than the analyses of Kosuke Kitajima presented in this journal. Consequently, while the attributions of Rebecca Soni's stroke are likely to be appropriate for women's swimming, there is a possibility that they might not be appropriate for men's breaststroke (although it is difficult to comprehend why they would not be). 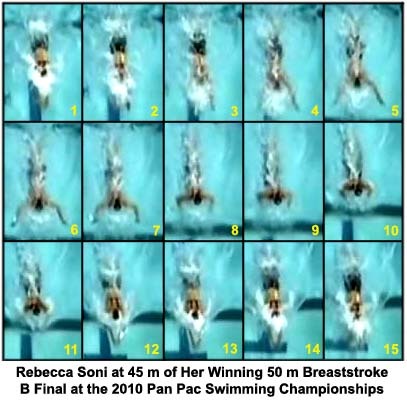 Only Rebecca Soni's arm action, specifically the locus of movement in the swimmer's frontal plane, is considered. The main features of the swimmer's arms are a reduction in resistance and a reduction in inertial lag. Frame #1: As the swimmer extends forward with her hands together, her head and shoulders are lowered further into the water. Frame #2: When the swimmer is streamlined (and assumedly the kick is completed), the arms begin to spread apart. Frame #5: The elbows bend, and undoubtedly are accompanied by medial rotation of the upper arms and outward rotation of the lower angles of the scapulae. The hands and lower arms move directly backward. Frame #7: The elbows continue to bend to bring the hands slightly inward. Some abduction of the upper arms has occurred to serve as a source of force production. Frame #8: The arm pull and abduction of the upper arms are completed. The elbows are at right angles to the shoulders. Frame #9: The elbows drop slightly. The hands are forward of the elbows and are likely to have been turned inward. The hands remain in front of the line of the head. The head and shoulders rise. Frame #11: The hands continue to move forward and gradually come together. This feature is quite different from the traditional arm description of the full recovery forward being performed with the hands together. Inhalation has occurred. Frame #12: The head and shoulders are thrust forward and downward. The hands have come together in this final stretch. Frame #13: The streamlining of the body, head, and arms occurs. Frames #14 and #15: The stroke cycle is repeated. The "long time" taken by traditional strokes that include an inward scull and a full recovery forward with the hands together is shortened. Rebecca Soni's hands make a small circular motion at the end of the pull and are then thrust forward and inward as the recovery. Usually, the inward scull is used to develop added forces that support an unnecessary very high head and shoulder lift as part of the breathing action. Rebecca Soni breathes much "lower" taking much less time than the current common action. The removal of the unnecessary inward scull and full recovery creates less turbulence than the normal technique, lowering one aspect of resistance production. The second feature of the hand movement path is that it shortens the time when no forward propulsive forces are being created, that is, the inertial lag of the arms. Rebecca Soni's hand-path takes less time and therefore facilitates higher rating. Because breaststroke is a double-cyclic action (arms followed by legs), reducing any deceleration between the two sources of propulsion is beneficial. Rebecca Soni's recovery does that although not to the maximum degree. The hand path that is depicted could be improved by the hands not coming together until the very end of the recovery. That is a minor detail for one stroke, but when accumulated over 100 and 200 m, could produce a significant drop in event time. However, the removal of the inward scull and full recovery is a very positive improvement in breaststroke swimming technique. Coaches would do well to institute this improved breaststroke movement.